Welcome back to the strange plight of Hal Singer, a jazz leaning saxophonist who was cooking up the types of meals that rock fans hungrily ate up only to find only to find to his dismay that they were coming back for seconds and expecting him to fill their plates once more. So now Singer must put on his chef’s hat again after having unexpectedly serving up a delectable side dish last summer, one which took him from his role as a mere line cook who was perfectly content to hide in the back of the kitchen and placed him as the master chef of his own thriving restaurant with all of the responsibilities and pressures that went with it. With this promotion to the big time the record he serves up here therefore becomes his first offering intended as a main entrée. The funny thing about it though is the chef himself would rather be back in the cramped kitchen merely adding spices to other cook’s dishes. Hal Singer was not particularly happy about his newfound star status in rock ‘n’ roll. While presumably grateful for the increased pay in leading his own band as a headliner, musically speaking he was disgruntled about what he had to do in order to collect that money. Namely play in a style that he felt was beneath him. Singer was, like many of rock’s first generation of musicians, an aspiring jazz artist who found himself taken from the ranks of his preferred style, one which was slowly fading from relevance, and thrust into the spotlight of a new far more rowdy genre that needed highly skilled people to essentially play badly. Or at least that was the way THEY perceived it. He’d been more than content to earn a few extra bucks as a sessionist for other artists playing whatever loud, undignified passages they asked of him, but it wasn’t what he wanted to make his name on. Luckily for him backing musicians at the time were largely anonymous to the public at large, especially on rock releases. Even when Wynonie Harris called him out on record prior to a solo he was referenced only as “Oklahoma!”, that being the state which Singer called home. And Hal Singer was perfectly fine with this anonymity. Making his transformation from shadowy figure on the periphery of the music to the man in the spotlight even more troubling for him was the fact he’d just been hired to play in Duke Ellington’s top notch band. While it was merely the 6th chair in the horn section, someone who likely wouldn’t have even soloed unless the first few saxes all came down with whooping cough simultaneously, Singer was in the process of fulfilling his dream by playing in such a high class outfit when suddenly he awakened and found that the innocuous session he cut as a leader for Savoy Records while waiting for his Ellington job to start had resulted in one of the hottest most explosive sides on the market that summer, epitomizing the honking tenor sax workouts that was leading the way in rock ‘n’ roll. Just like that, completely unintentional, his career… his life… suddenly headed in another direction. Embarrassed by the newfound attention for something so uncouth Singer had tried to keep playing with Ellington as if nothing had happened, fervently hoping nobody in the band even noticed he was riding the biggest hit any of them had been associated with in years, but finally the Duke let him know that it was stupid to pass up a chance at making big bucks to headline rock shows just so he could play a little noticed supporting role in Ellington’s band and encouraged him to go out on his own and take advantage of his newfound fame. Quite possibly never before had anyone in music viewed becoming a star with such dejected resignation as Hal Singer. So it would interesting to see how this all played out going forward. Would Singer’s newfound popularity be too alluring to pass up, an enticement into abandoning his loftier pursuits in exchange for leading the charge into the rock wilderness, or would he view this as a deal with the devil and look to almost sabotage his own chances by delivering less than convincing follow-ups in hopes of falling flat on his face and returning to the sixth chair behind Ellington or – perhaps if he flopped badly enough – playing in a club band somewhere on the outskirts of Toledo or Indianapolis. Singer, who as of this writing in 2017 is still with us in the flesh approaching 100 years of age, has never been shy about disavowing his hit-making career in rock, but at the time what mattered if he was going to make a go of it in this field was how deep was his commitment to rock ‘n’ roll really was and would that be enough to sustain him commercially and creatively for the foreseeable future. Let’s start off this meal by reminding everybody that Beef Stew was a hit, albeit a small one in comparison to Cornbread which went to #1 and remained on the national Billboard charts for 23 weeks. By comparison this follow-up record lasted only a week at #11, giving ample cause to think it was merely a case of the rabid fan base of his debut snatching up the next record on sight and being profoundly disappointed, thereby freeing him of his obligation to them, to Savoy Records, to rock ‘n’ roll itself, now giving him permission to be able to go back into the jazz world with a few bucks in pocket for his troubles and to provide insulation for the good-natured abuse he’d likely get from his fellow snooty musicians. Was that really the case though? No, it wasn’t, certainly not when looking at how it all played out. He DIDN’T go back to jazz, not right away at least. Instead he kept cutting rock records, touring consistently off the success of that initial record, and only years later when the interest in him from that constituency died down completely did he return to jazz full-time and spend the rest of his waking hours decrying his time spent in rock ‘n’ roll purgatory. So consequently there’s a lot of ways to look at Beef Stew depending on your perspective. Since it kept his commercial winning streak alive you could choose to see it as a success… unless you were Hal Singer and were secretly hoping it’d flop so you’d be dismissed from the rock fraternity altogether and get to go back and play what you had wanted to all along. Or Singer might be let down that it wasn’t AS successful as he was last time out, his personal pride taking a hit for not following up his monster success as strongly as everyone would’ve liked. What of Savoy Records, who like all labels needed hits to stay in business and preferably the bigger the better. Was this big enough to satisfy their expectations or did they view its relative shortcoming in comparison to his chart topper as evidence that they’d merely caught lightning in a bottle that first time out? Creatively speaking did producer Teddy Reig feel as if this effort contained the right formula for success or did he know that they’d accidentally hit on something so profound right out of the gate with Cornbread that it couldn’t be duplicated no matter what? Then there was the record buyers themselves, did they see this as another worthy addition to the wall of noise they were all embracing or were they starting to feel a sense of overkill with this parade of honking anarchists ruling the charts over the past year and was their enthusiasm for this type of record waning ever so much? Or did Beef Stew veer TOO close to what he laid down already, giving listeners no reason to buy the same type of performance again… or was it a case of him not coming close ENOUGH to that earlier sound and thus he lost their interest with an inferior alteration of the formula. Wonderful questions all. Hopefully these are equally wonderful answers. To start with the musicians joining Hal Singer on this outing are entirely different from those who sat in with him on Cornbread last June in violation of the recording ban in effect at the time. Presumably the others weren’t locked up for their transgressions against musical civility so this change is the first evidence that we see as to Singer’s mindset regarding his solo excursions, namely what type of group would he put together to satisfy his own creative urges. The composition of the band remains the same instrumentation wise with one notable addition, that of a trumpeter. Last time out he had none, thus helping to explain that record’s modernity, but this is yet another example of how jazz and big band rooted musicians still clung to the notion that the trumpet was a vital attribute of a horn section. It’s not the trumpet that is the most out-of-place horn though, at least at the beginning. That would be the trombone, something that WAS present on Cornbread. Though manned by a new musician and playing with a spirited enthusiasm the sound is a little ill-suited with its drawn out responses in the first section. It makes the song sound slightly gimmicky at that point. Trombones in general are tricky instruments to fit into rock settings. James Brown was able to pull it off occasionally, but he’s James Brown and everybody else isn’t and normal rules never applied to James. Not until recently when Trombone Shorty, acting as the focal point of his own group, rather than a sideman, has anyone really given the instrument a proper platform with which to be utilized and on Beef Stew the early reliance on it weakens the set up considerably. But once that section fades into memory we’re left to deal with an old advisory, namely the intrusive trumpet, another instrument whose image never quite fit in with rock, although more top names (Dave Bartholomew, Pee Wee Ellis, Wayne Jackson, Cynthia Robinson) played it effectively throughout rock’s history showing that it was at least possible to pull it off. But the trumpet is like a very strong spice, a little goes a long way and it takes a very light hand to dispense it properly on record or else it tends to overwhelm every other sound. Here it comes close to doing just that, for while Singer’s tenor is obviously the lead and gets the most time in the spotlight, the trumpet jumps into the fray 45 seconds in and makes its presence known. Singer wrests control from him, but the two battle it out for the entire middle eight, trying to whip the excitement up with their byplay but sounding more chaotic than rousing. The best stretch follows when Singer gets the floor to himself, reeling off some good passages with plenty of gusto but then both of the other horns join in for the conclusion which never reaches the level of anarchy required to convince those listening to cut loose with abandon on the floor. Instead it clashes somewhat, sending this into an exhausted heap of mismatched parts, effective enough to keep your hopes up without ever truly fulfilling those hopes for anything transcendent. It’s obvious what they were going for and it’s just as obvious where they fell short. While Singer’s own parts are suitable for rock’s needs, nothing else about this really fits. The other horns need to be jettisoned (a baritone sax replacing trumpet and trombone would’ve transformed this into something potentially special), the drummer needs to be woken up and the pianist has to take his left hand out of his pocket and use it to help establish the bottom off of which the entire production should ride. But that was something still alien in nature to those who came of age in another time and another field and so it was something still being resisted, that is if any of them were even aware of what was lacking to begin with. When they stumble across the right formula, one with a heavy bottom and a constant sense of propulsion, it might’ve been accidental but it was often magical. However when they tried to adapt the most obvious components of rock to their existing sensibilities like on Beef Stew inevitably they’d get some of it right but much of it wrong as well and thus the end results were frequently compromised. In the end I think all of the theories laid out at the start of this were true in some way. Singer’s ego meant he would indeed try and prove his initial success wasn’t a fluke, so he gave in to the calls to honk in order to try for another hit. But at the same time his professional pride wanted him to exhibit a better musicality and so he assembled a band he felt could aid in that cause and maybe bring this rock crowd along with him towards “better” music by slipping it in without their really being aware. But the audience is much smarter than the musician in these cases because they have no ulterior motive, only a very base need to be won over by the music that moves them the most, and already by 1949 this wasn’t quite it. They certainly accepted it but not with the same fervor as they had with his last outing. Cornbread had been a record that had transformed the landscape and they loved it as a result, by contrast Beef Stew was a bit harder to love, precisely because they weren’t convinced that Singer himself loved it. Ironically though for Singer it was successful enough to keep him tied to rock for the foreseeable future but not successful enough to be at the front of the pack any longer and so, at least the way he probably saw it, he was stuck in an uncomfortable limbo for the time being. A reluctant rocker. 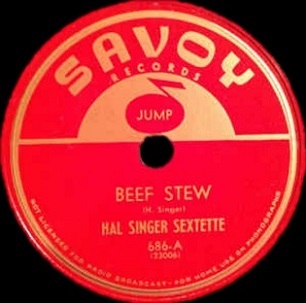 Leave a reply on "Hal Singer: “Beef Stew”"